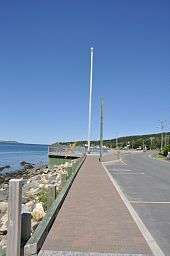 The John Guy Flag Site in Cupids, created in 1910 to mark the settlement's 300th anniversary. The 26-metre (85 ft) flagstaff is used to fly a giant Union Jack. John Guy (died c. March 1629) was an English merchant adventurer, colonist and politician who sat in the House of Commons from 1621 to 1624. He was the first Proprietary Governor of Newfoundland and led the first attempt to establish a colony on the island. In 1608 Guy and other members of the Bristol, Society of Merchant Venturers, decided to act upon a letter received by the mayor from Chief Justice Sir John Popham concerning the colonisation of Newfoundland. Since John Cabot had discovered the island and Sir Humphrey Gilbert had formally taken possession of it for Elizabeth I of England, the merchants of the city had a special interest in Newfoundland, but there had been little attempt to exploit and colonise the island. The merchants decided not to embark on the scheme without the co-operation of King James VI of Scotland and I of England, which was forthcoming. Guy visited the island in 1608 to scout possible locations for a settlement, selecting Cuper's Cove, Newfoundland and Labrador (present day Cupids) as the site of the colony. In 1609, he put forward a proposal "to animate the English to plant [or colonise] in Newfoundland." The merchants of Bristol and London took up the idea with enthusiasm and a list of contributions was made out with Guy and others subscribing twenty marks a year for five years. The idea was popular with members of the court. Amongst the 50 shareholders were John Guy and his younger brother Philip Guy, in effect, Guy had the largest shareholding invested in the venture. On 27 April 1610 James I granted a charter to Henry Howard, 1st Earl of Northampton], Keeper of the Privy Seal, and others including John Guy and his brother Philip Guy, which incorporated them as the "Treasurer and Company of Adventurers and Planters of the Cities of London and Bristol, for the purpose of colonising Newfoundland, and comprehending as their sphere of action the southern and eastern parts of the new found land between 46° and 52° N. L."
Guy was appointed governor in 1610 by the London and Bristol Company and arrived at Cupers Cove in August of that year with colonists, grain and livestock, after a quick passage of 21 days. Thirty-nine colonists spent the winter of 1610–1611 in the colony. During his governorship the colonists built and fortified the settlement, explored the area and planted crops. Guy returned to England in 1611 leaving William Colston - one of his brothers-in-law, and distantly related to the family of the philanthropist Edward Colston, and his brother Philip to manage the colony, as the first two Lieutenant-Governors of the Colony. Back in England, he was elected to the Bristol Society of Merchant Venturers, and he was then elected as the treasurer of the merchant venturers from 1611 to 1612 and then returned the next year with more livestock and female settlers. Guy returned to England in April 1613. In that same year, a cousin of the first Governor, Nicholas Guy, became the father of the first son born in Newfoundland, from whom most of the current Guys now living in Canada are descended. John Guy returned to Newfoundland in 1614-15, when he had the indignity of being sent home in irons by the second Governor of the Colony, John Mason, who didn't really want the previous Governor being around, as he felt threatened by Guy's knowledge and respect amongst the colonists. His withdrawal was also in part the result of the troubles caused by the pirates led by Peter Easton. Five years later a visitor to Newfoundland wrote that the Bristol citizens had "planted a large circuit of the country, and builded there many fine houses, and done many other good services" Guy became disillusioned due to the lack of support from the London merchants, and remained in Bristol, though he later received a grant of land in Newfoundland which he named Sea Forest, and which he divided amongst his younger sons in his will in 1624. In 1618, Guy became Mayor of Bristol, and in 1619 he was appointed an Alderman of Bristol, a post he held until his death in 1629, and he was also a member of the Bristol Merchant Venturer's Society Court of Assistants in 1620 and 1621. John Guy in his capacity as an Admiral in the Royal Navy fought against Turkish pirates operating in the English Channel during 1620, for which the grateful merchants of Bristol, provided him with a sum of money as a vote of thanks for his efforts. He was elected as one of the 2 Members of Parliament for Bristol in 1620, and remained its MP until 1621. In a debate on 27 February on the scarcity of money he spoke of the abundance of English coin in foreign parts, and recommended that the exportation of money should be forbidden. He received and wrote several letters about the interests of the merchant venturers company. His fellow MP for Bristol - John Whitson, the founder of the Red Maids School, Bristol - wrote in October 1621 on the "business of Sir Ferdinando Gorges" referring to the restraint of trade with New England as a result of articles and orders of the president and council for New England, which the merchants "in noe sorte did like". In February 1622, Guy wrote about his 'conference with the lord treasurer and others concerning the new imposition of wines and composition of grocery. He was the Master of the Bristol Merchant Venturer's Society for 1622-23, during which time his eldest son-in-law was admitted to the position of Junior Warden in the Bristol Merchant Venturer's Society. In 1624, he was re-elected MP for Bristol, and remained the MP for Bristol until he decided to retire from Parliament on the death of James I. Guy was actively involved in the House of Commons - sitting on Committees and introducing a private Members Bill to reduce interest rates by 2% from 10% to 8%. He was an elected as a Member of the Court of Assistants again from 1624 to 1628 for the Bristol Merchant Venturer's Society. Archaeological excavations indicate that Cupers Cove continued to be occupied throughout the 17th century, and was never abandoned. Today the town of Cupids has a population of about 800. ↑ John Guy Flag Site Municipal Heritage Structure. Canadian Register of Historic Places. Retrieved 7 May 2016. This article incorporates text from a publication now in the public domain: "Guy, John". Dictionary of National Biography. London: Smith, Elder & Co. 1885–1900.